Peter: White walker weather. What a terrible day. Brett: And me without my obsidian knife. Peter: Obsidian umbrella should do the trick. 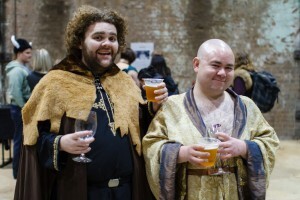 Sammy: The only thing I brought is the drinking capacity of Robert Baratheon. 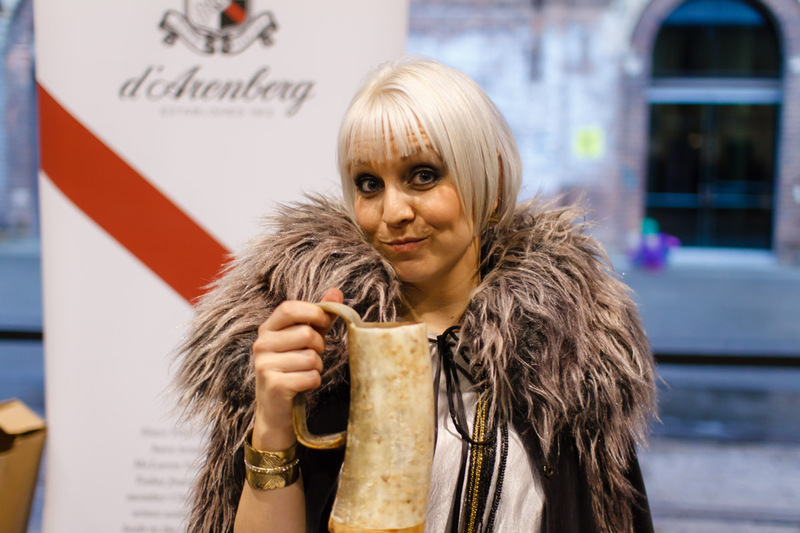 We’re becoming regulars at these sort of events, and so we knew to first head to the tavern to bard our stomachs with mutton and cheese. We then turned to head out into the throng of vendors when—wait, is that a dragon? It became quickly apparent that this was not going to be your usual wine tasting event, with vendors and punters alike cosplaying as their favourite characters (or sometimes simply slapping on some medieval garb). 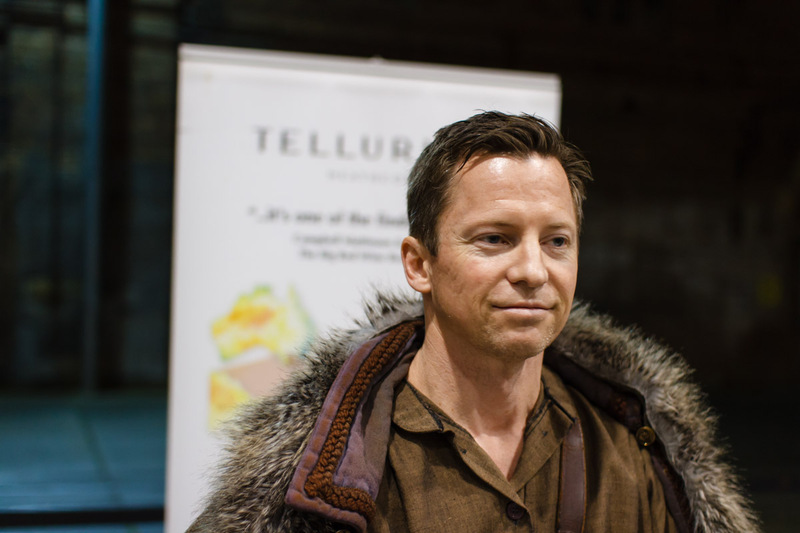 It was fantastic to see people get into the spirit of the event and I had to do a double take on an absolutely dead-on Littlefinger impersonation. 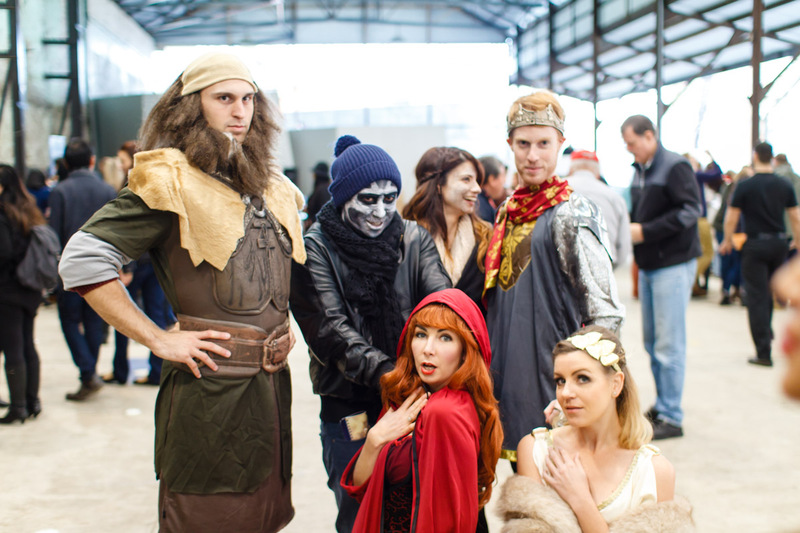 Although the vast majority were not costumed this way, it gave the event a more fun, playful atmosphere than your usual wine tasting. It is a little hard for things to get pretentious if you are swirling and sipping next to a dude in a dragon onesie. Even the vendors joined in the act. Sourthern Rhone: Warmer climate with a huge variety of different types of grapes. Tends towards blends in a more fruit driven style. The Rhone Bar offered a $20 Sommelier’s tasting, to try 4 different wines starting in the North and venturing down to the South. For the price this was an opportunity to be introduced to some quality French reds and also taste very different flavours to Australian wines. Thoroughly recommended and if there is the chance to do it again, this will be high on the priority hit list. Yeringberg 2011 Marsanne Roussane – An unfamiliar blend. This was a thick bodied textural white. Thoroughly enjoyed it. Yalumba 2012 Hand Picked Shiraz Viognier – Viognier aroma was not as strong as I would expect on this. Red fruit and elegance with a lovely length. Giesen 2011 Shiraz – Green and edgy in an interesting way. Yalumba 2014 Eden Valley Viognier – This was a mellowed Viognier, with strong notes of citrus on the nose. A mouth-filling flavour though, and much less ephemeral than the fleeting taste profile I usually associate with Viognier. Yalumba 2012 Hand Picked Shiraz Viognier – Lovely aroma on this. The Viognier adds distinct notes to the palate which made me raise an eyebrow. It’s tannic, but not too strong, with a good length. This Dornish red will definitely be making its way to my cellar. Innocent Bystander 2014 Known Pleasures Shiraz – All of the Innocent Bystander wines had something to offer, with other wines presented having creative integration of whole-bunch grapes to add something ‘different’. But the Known Pleasures was clean, direct as a sword to the face, while remaining refined. Yeringberg 2011 Marsanne Roussane – A unique blend that’s quite fragrant and fruity. The nose grabs you and the richness on the palate surprises. Something I’d definitely want to taste more. 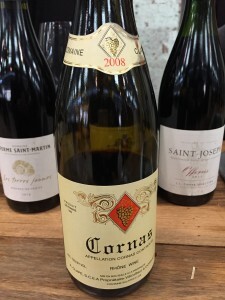 Domaine René Rostaing 2010 Cote Rotie Ampodium – The last wine we tasted at the Rhone bar and it was my fav, a 100% Syrah that’s powerful and elegant (my small gripe is that it could do with a little oomph on the bouquet, i.e. a touch of Viognier). 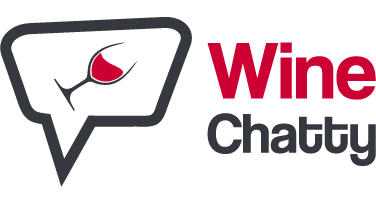 Seppelt 2013 Chalambar Shiraz – A bargain priced Shiraz that I’d drink anytime. 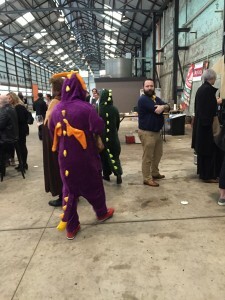 There can often be a stuffiness about these wine festivals which can be intimidating for rank amateur, when surrounded by experts who can rattle off varietal, vintage and characteristics without blinking or taking a breath. 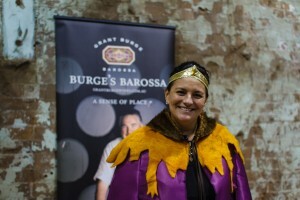 Game of Rhones was incredibly fun, and particularly successful in re-framing wine tasting in a fresh new perspective. For example, the Yalumba stand were carving up a large platter of salami (yours for the bargain price of an @mention or Facebook tag), and they managed to keep the mood light with a never-ending string of sausage jokes. In keeping with the theme, they also had a blind-tasting competition (where you had to pick the varietal, vintage, and region), and the prize was a pig on a spit in your backyard! Much of the fun of the Game of Thrones TV show is watching the cavalcade of characters bounce off each other in ever complicating webs of intrigue, and in many ways it is the cast of characters who owned the day at Game of Rhones too – the winemakers, sommeliers, and organisers were awesome, friendly, and approachable. Maybe it is just me, but there is a comfort level achieved when the sommelier is wielding plastic weaponry and decked out in a faux-fur trimmed leather tunic. 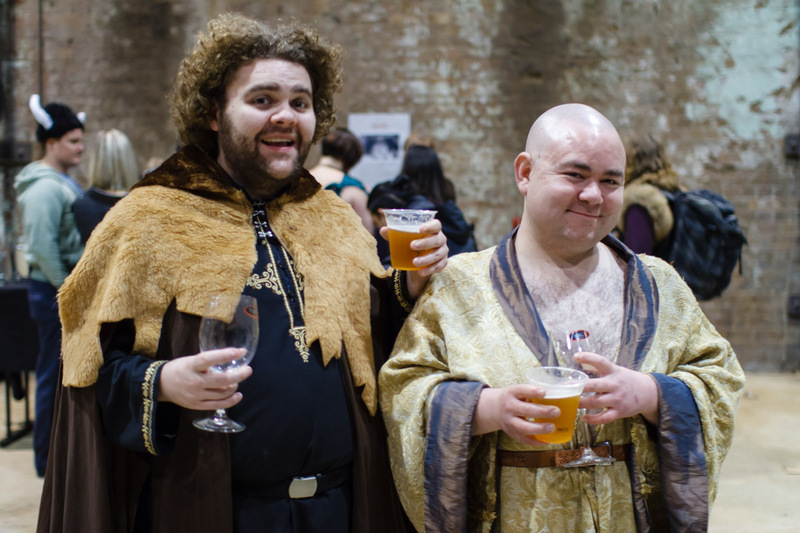 And just as one would encounter an incredible variety of people, history and cultures travelling the lands of Westeros, so too we encountered an incredible length and breadth of wine styles and varieties in the tastings on offer. 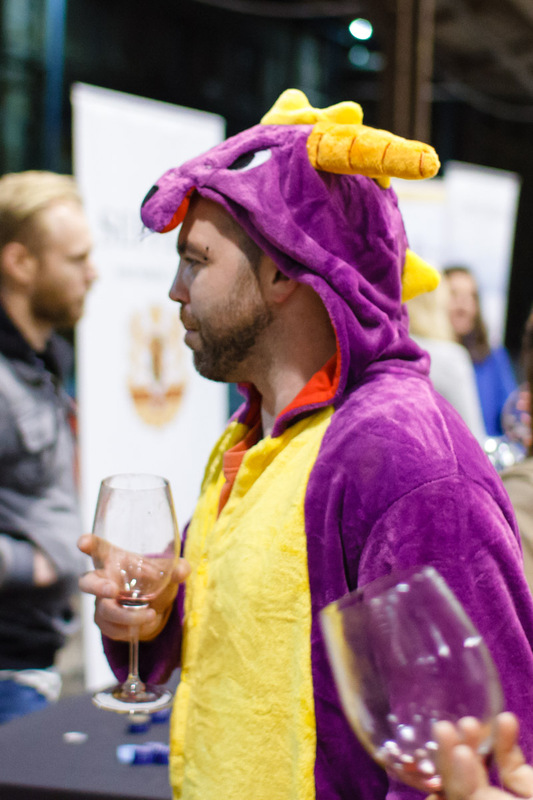 If Game of Rhones sounds like the type of fun you’d enjoy, then make sure to check out Pinot Palooza that’s held later in the year. 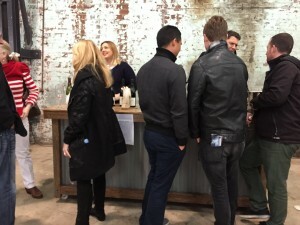 Pinot Palooza is a Pinot Noir themed tasting event also run by the folks at Bottle Shop Concepts, where Pinot Noirs from Australia and New Zealand are placed side-by-side with excellent music, great food, and a similar light-hearted and friendly vibe. There’s more information at its event page for each individual city (Adelaide, Brisbane, Melbourne, Perth, Sydney), or follow the organizer’s twitter feed (@DanSims) for more updates. This post is really cool. I have bookmarked it. Do you allow guest posting on your site ?